Summary: The final walk of a Peak District weekend was shorter than our usual outings as my friend Steve had to get to Birmingham airport for a four o'clock flight. This was not a bad thing as we had all to travel home too. I had chosen this walk as the final day walk along a long edge with open moorland to the east and great views over the edge to Derwent Dale and Goit Dale to the east. The walk along the edge lived up to all my expectations and it was enjoyed by all. The three great days of weather on our long weekend in the Peak District did not extend to the final day. It was not raining but it was an extremely dull day we woke up to, all due to a weak low pressure system drifting south. 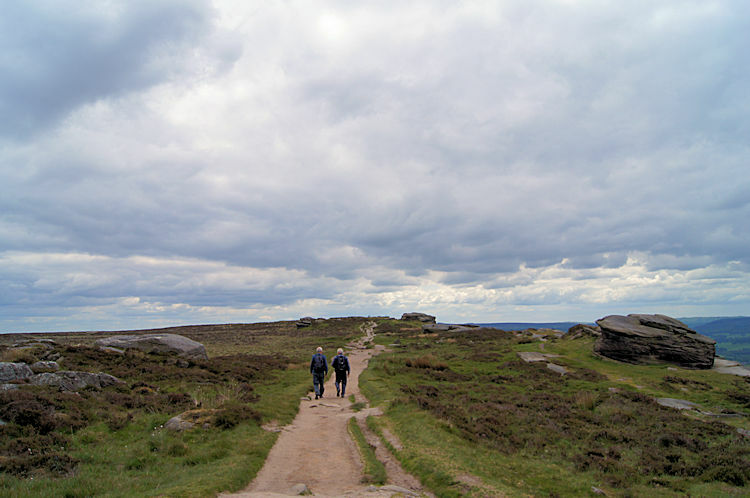 Despite the depression in the air there was no stopping us, we had a final short spectacular walk to enjoy along a long gritstone edge. 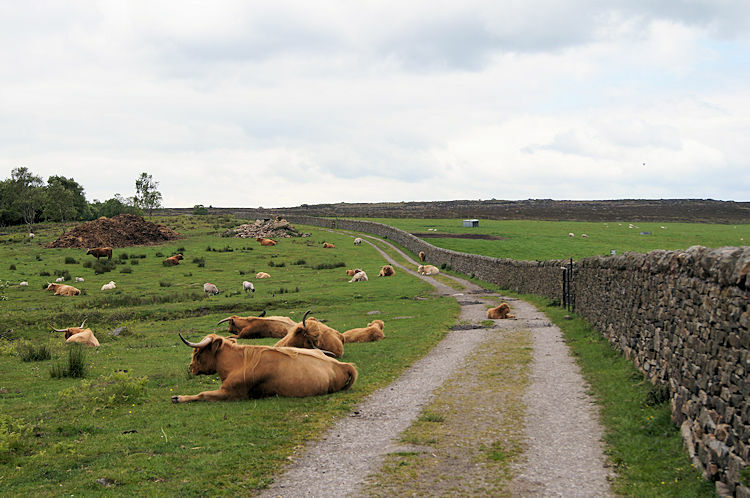 As we were subject to a time restriction the walk was a linear one so we deposited my car at the finish in a car park on the edge near Nether Padley and drove to our start four miles away in Steve's car. It had been an eventful day before the start of the walk. We all went out last night in Buxton and enjoyed a few pints before finishing off with a delicious curry. Then in the night rumblings occurred in our digs. Joe and I had a peaceful night in our room but next door there had been sinister goings on. Steve first got up at around 5.00am and went a walking. He was to do four further times before breakfast. Meanwhile Dave had woke up in the night in a feverish sweat, all soaked through. A nightmare had interrupted his well earned slumber and probably caused by Steve's somnambulism. It must have been a restless room that night. 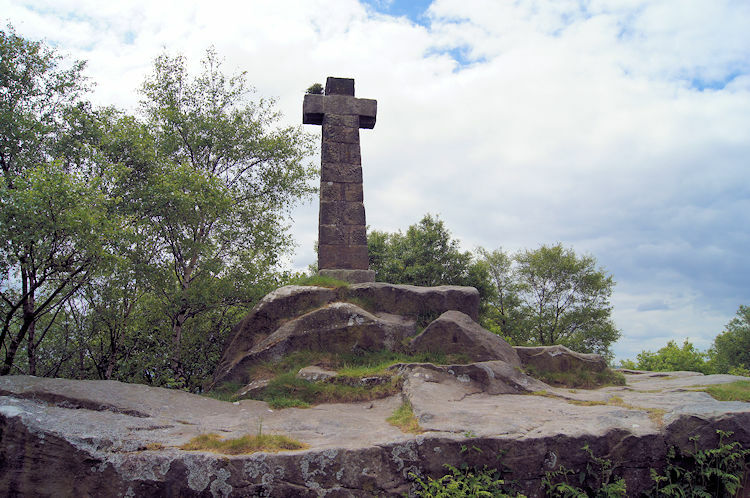 The interruptions had not dampened their spirits for the walk though and we set off on a track towards Baslow Edge for a meeting with Wellington's Monument and the Eagle Stone. 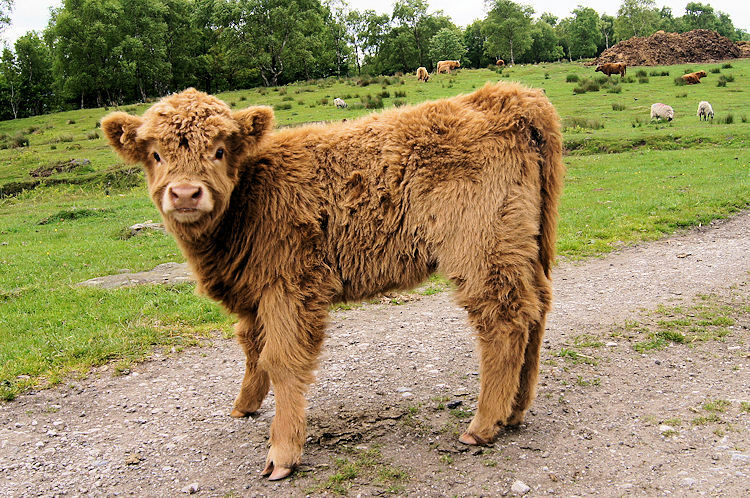 Immediately we came across a hers of Highland cattle. They were extremely benign despite the mothers having very young calves with them. It was a friendly encounter. As we walked along the well made track we chatted, laughed and reminisced over the events of our short break. We had all thoroughly enjoyed ourselves and we all intended to continue to have fun until our parting of ways a few miles walking ahead of us. Staying on the intended track took us past but not close to the interestingly named Eagle Stone. I had to detour and made a beeline across the moor to inspect it up closely. 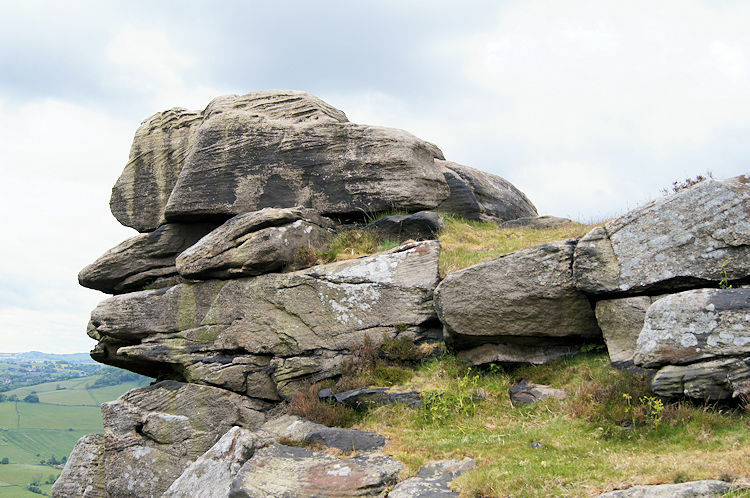 It was an interesting lonely outcrop on the moor and from one angle the Eagle face profile was quite clear. I gazed on it, walked all around then ran back across Eaglestone Flat to rejoin the gang who were looking at Wellington's Monument. 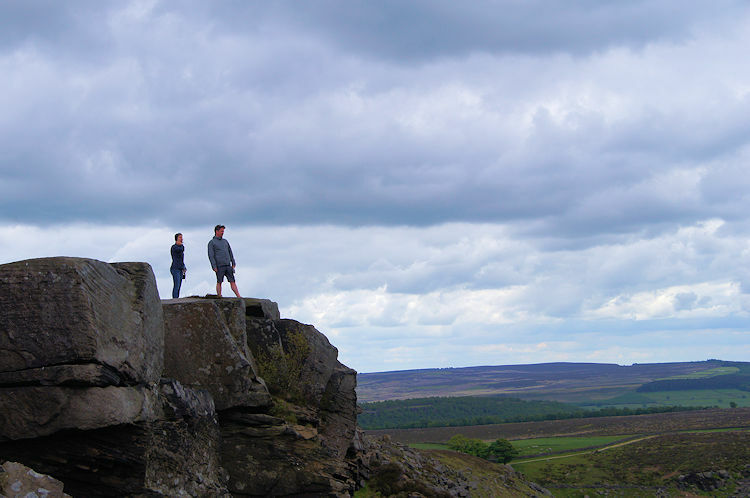 After Wellington's Monument we made our way closer to the edge at Curbar. Although it was overcast, a quite brisk wind was blowing the clouds away. 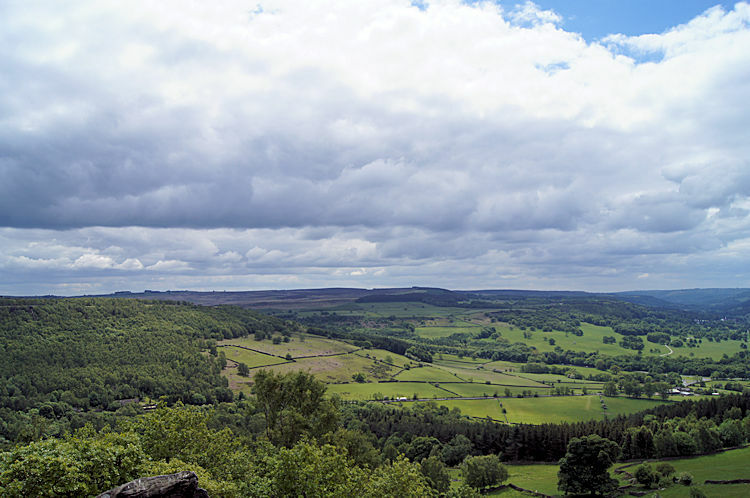 The views were good and we could see all the way south to Chatsworth Park and the magnificence of Chatsworth House. Other walkers enjoying the views from the edge were doing the same. The immediate views over the edge itself were also spectacular with interesting rock features scattered along the escarpment and as a result there were lots of overhangs to explore. As with the Roaches near Leek which we walked two days earlier this is a popular rock climbing area but with it being Monday there was not a rock climber to be seen. 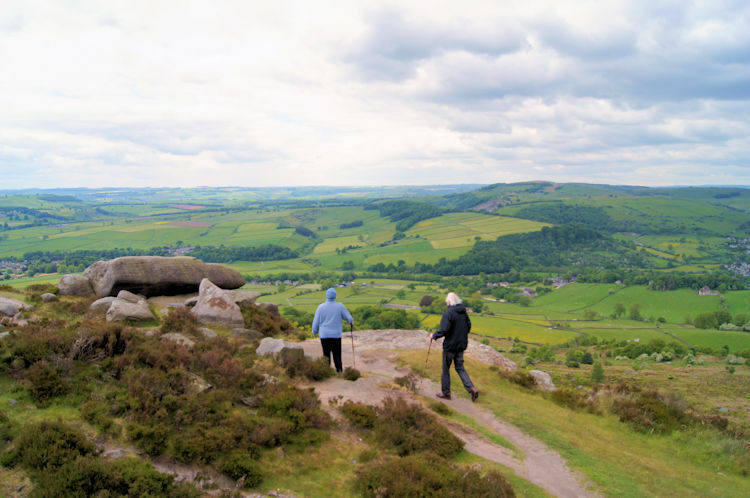 Despite the lack of rock climbers to be found we did come across small groups of walkers from time to time as we made our way from Curbar Edge to Froggatt Edge, the change only relevant in name of the village below. It was the same gritstone edge all the way but with distance the views to habitation below changed. Near Wellington's monument we could look down on Curbar. 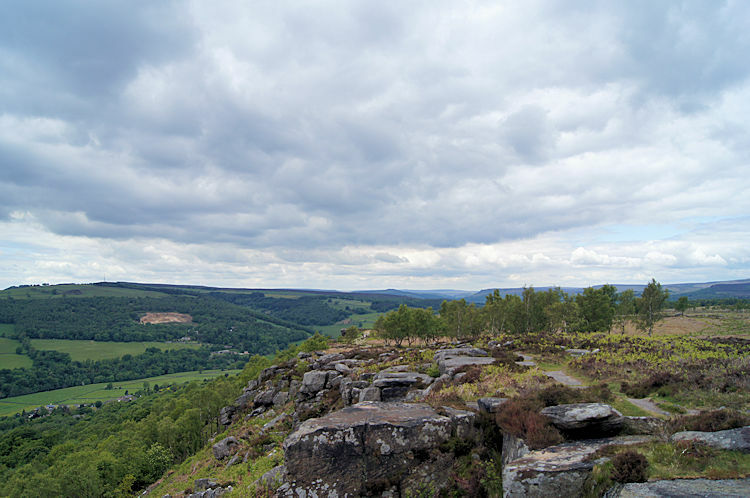 On Froggatt Edge we looked down to Froggatt and Grindleford. We took turns to stop and look across the edge and to walk. Eventually we had continued along the edge far enough to begin a descent towards the site of a stone circle. Dave found the location of it and we looked it over. The much anticipated stone circle was not impressive and Dave commented "That is just about the worse stone circle I have seen. In fact it is the worse I have ever seen". could not disagree, it could easily have been a modern and random arrangement of stones. 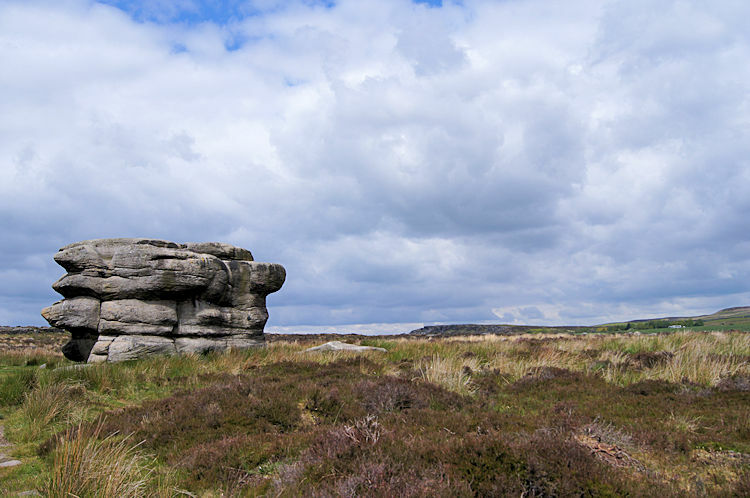 Soon after our uninspiring stone circle inspection we were leaving Froggatt Edge behind and we soon crossed the A625, then walking through a dell and back to my car. Now our walking was done and I drove back to Steve's car where we said goodbye to each other. I look forward to the next time we go walking. And well done Joe, we were all impressed with your walking throughout the weekend. Get the leg sorted out Dave, we want you back at your best. Finally, what a fabulous edge walk it was to finish off our long weekend walking in the Peak District.